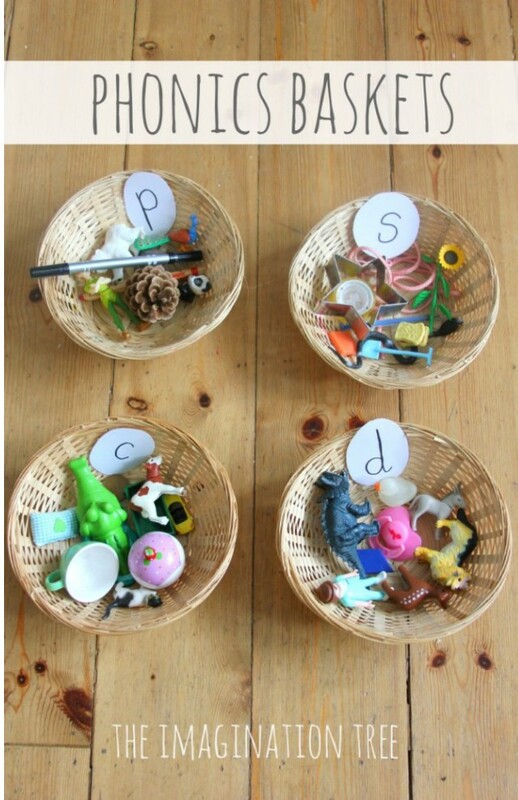 This phonics activity can be created using toys or things you find in the home or classroom. Write down the phonemes on a piece of paper that you’d like your child to practise. Ask them to put each object starting with the same phoneme into the corresponding basket. You can now turn passwords off completely so children can log in using only their name. Just pop into your account settings to do this. If you’re using auto-generated passwords, you can now choose to print out your passwords in capital or lowercase letters on password cards or in letters to parents. Password cards, certificates and posters can now be downloaded in bulk. You can download posters and certificates for all your players, particular players or those in a group. Progress reports can now be downloaded for a whole group so you can compare the stats across a class. We have made sharing the game easier. Teachers can now easily edit a letter to parents. The letter contains login details for each of their students and can be printed in bulk. We hope you find these new features useful – many of the changes have come out of conversations with our players. Please get in touch if you have further suggestions, ideas or feedback about the website and game. We’d love to hear them! 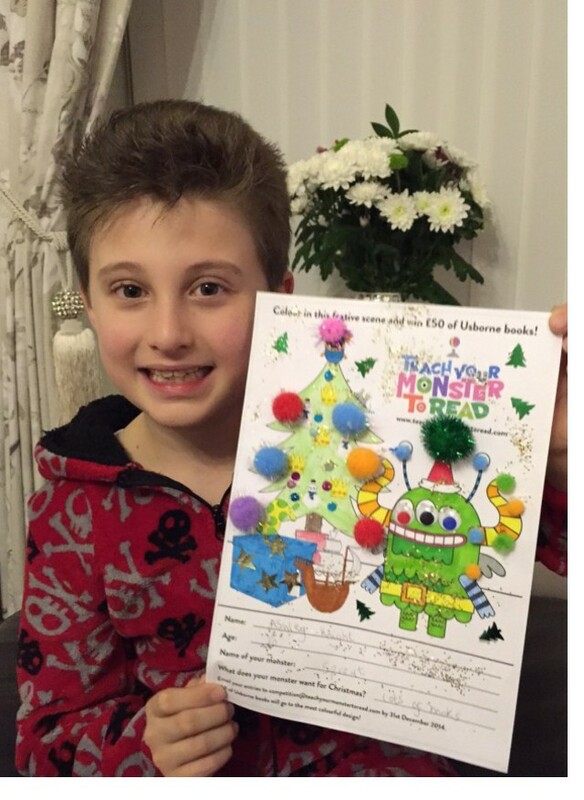 Congratulations to Ashley Knight, the winner of the Teach Your Monster to Read Christmas colouring competition! Ashley created the monster ‘Sprout’. Sprout wanted lots of books for Christmas – we think he’ll be happy with his book prize. Here is Ashley with his winning picture. 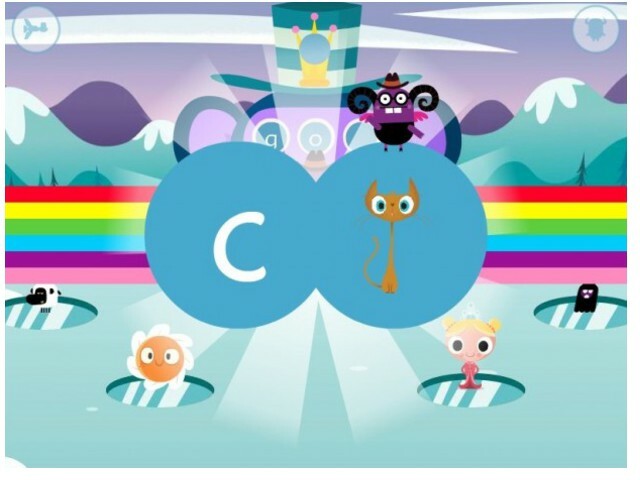 “The winner for me is definitely Sprout by Ashley because I love the goggly eyes, pom-poms and glitter that have been added. Very creative and very Christmassy. Also the colouring in is really neat”. Here are some of the other fantastic entries into the competition. Thank you for sending through your monsters. 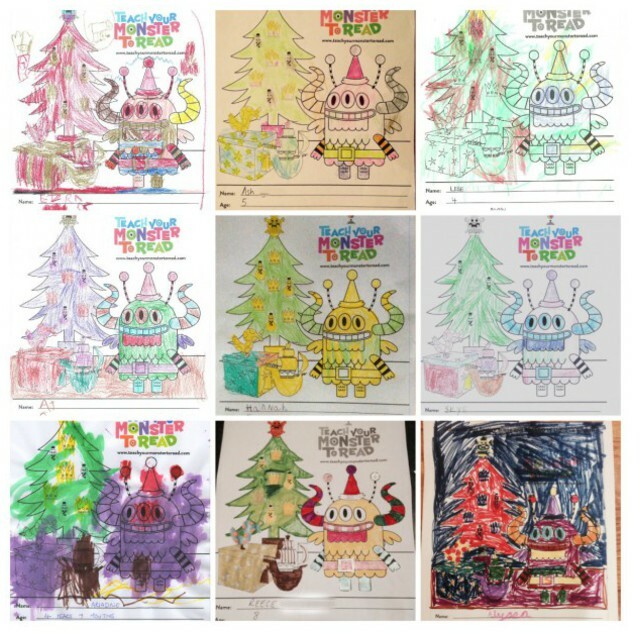 We’ve launched a fun and festive colouring in competition just in time for the holidays. The winner will receive £50 of Usborne books. Colour in this downloadable picture and email your entries to [email protected] by 31st December 2014. Rich Wake, the wonderful illustrator for Teach Your Monster to Read will judge the entries. We’re looking for the most colourful designs! The team at Teach Your Monster to Read would like to wish all our players (monsters) a very merry christmas! 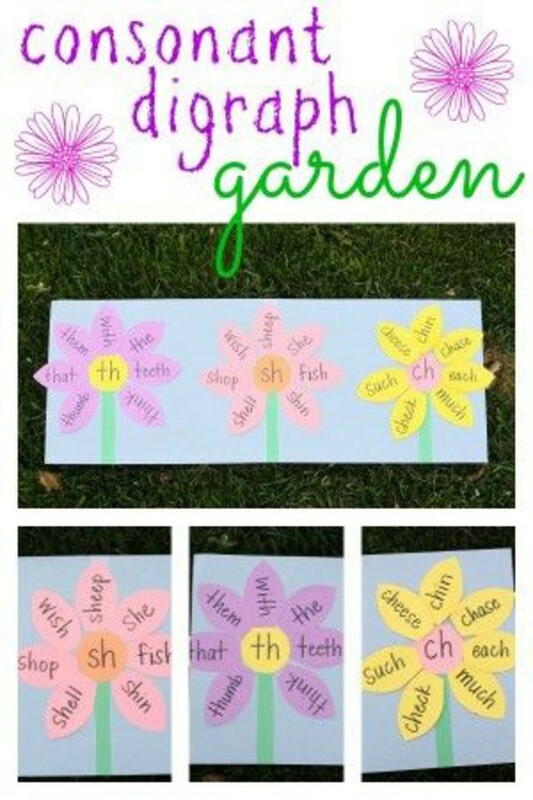 This colourful phonics activity was found on Jenae’s www.icanteachmychild.com resource site. This activity is about about sorting words that contain digraphs: /th/, /sh/and /ch/. It also includes decodable words like ‘that’ and ‘ship’ and tricky words like ‘the’ and ‘she’. 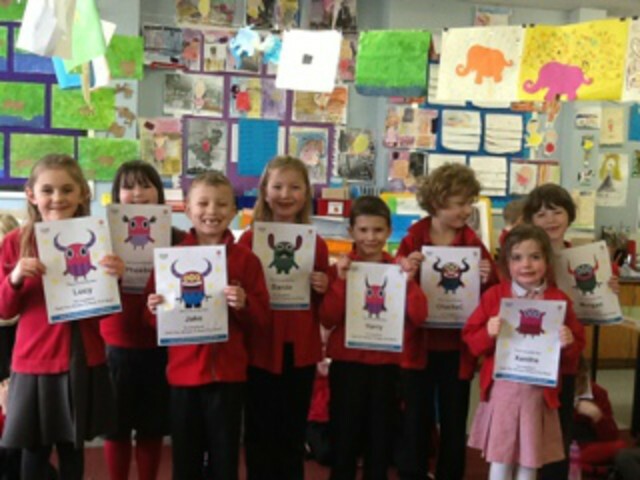 Help us to improve Teach Your Monster to Read. We’re asking teachers to join us for a 45 minute phone call where we’ll ask you a few questions about how you teach reading in school. The research will help the Teach Your Monster to Read team to think about future developments and resources. N.B. We’d also like to talk to teachers who do not currently use Teach Your Monster to Read in school so please pass on to any teachers who might like to help us with this research. Teach Your Monster to Read – 2 million plays. 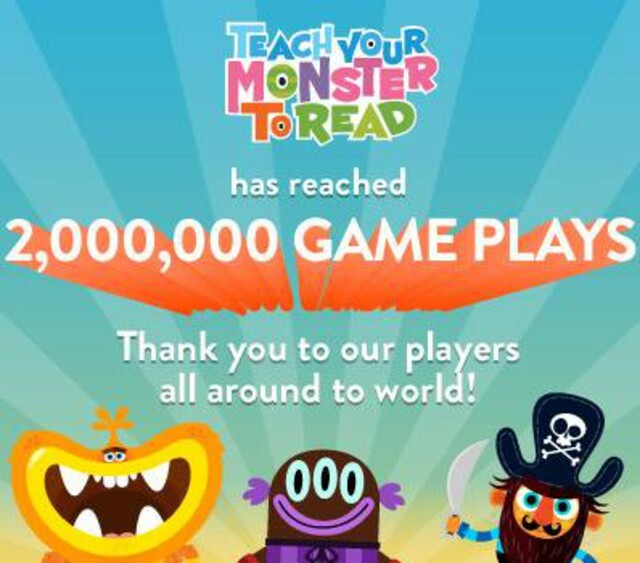 We’re proud to announce that Teach Your Monster to Read has reached 2 million game plays! This is fantastic news for the Usborne Foundation because we know the game is helping more and more children learn to read. Thank you to everyone who has played the game and we hope you’ll share this free online reading game with other parents and teachers. 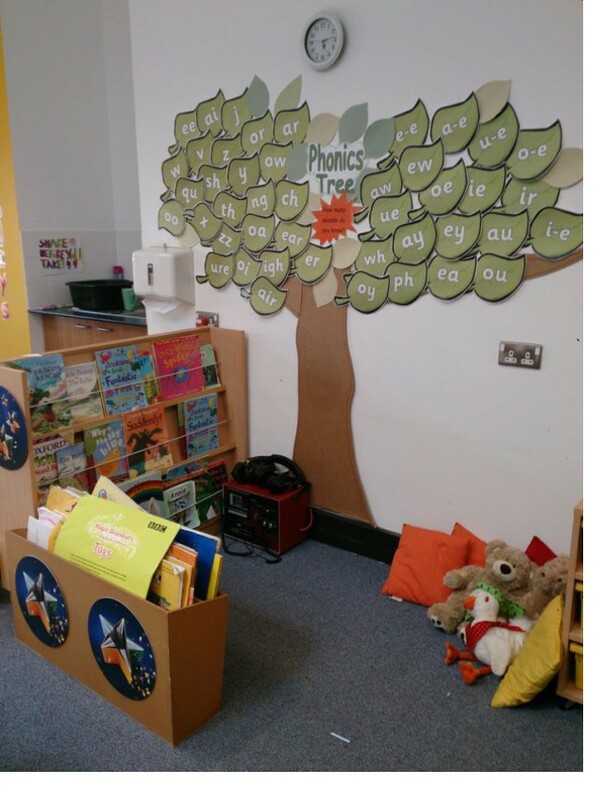 Another simple, eye-catching phonics resource is the classroom phonics tree. Monster Tip: You can create a ‘Tricky Word’ tree for your classroom too. 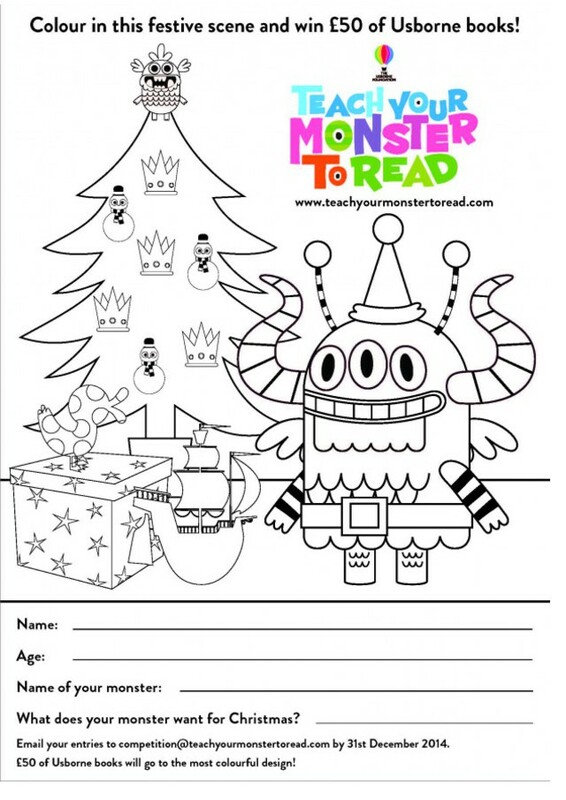 Download our Teach Your Monster to Read colouring in sheet and create your own monster at home. 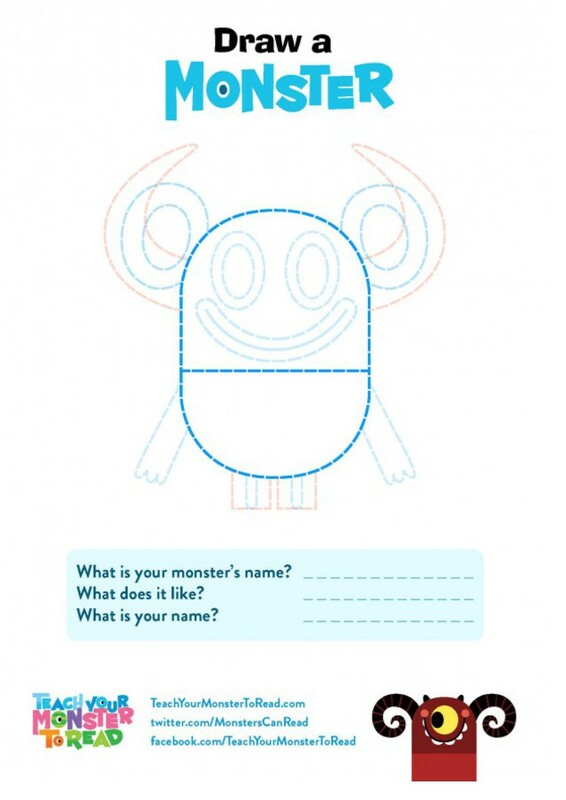 Download the file by clicking this link: Monster Printable. We’d love to see your homemade monsters! Share them on our Facebook and Twitter accounts. Meet the monsters this half term! Teach Your Monster to Read will be heading to London, Manchester and Cardiff with Save the Children to share and celebrate the magic of reading! These free reading events will offer lots of fun activities for families; including storytelling, poetry and a treasure hunt hosted by some of the nation’s most famous faces, authors and illustrators. There will be interactive sessions with Teach Your Monster to Read where children can play the game on iPads, win Usborne books and meet the monster himself! We cannot wait to introduce the monster to our fans!